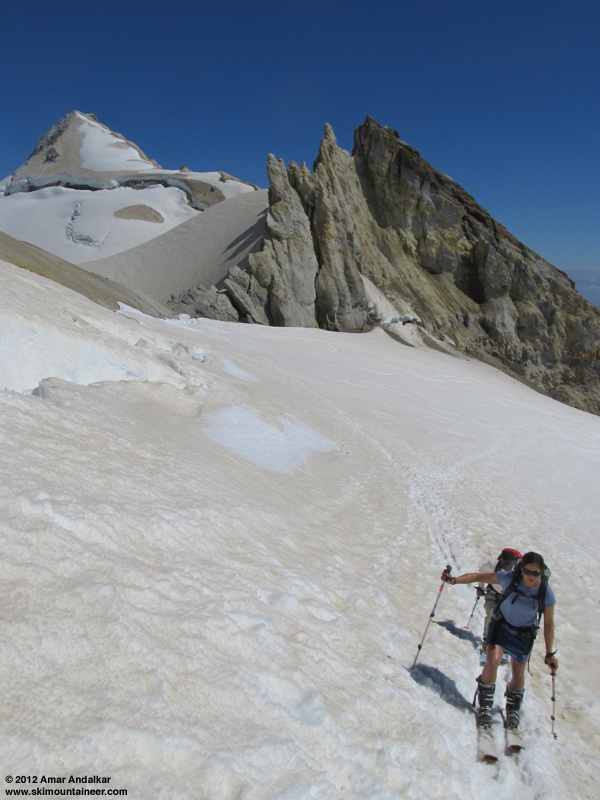 Really excellent conditions considering that it's almost August: mostly smooth corn snow and manageable crevasses from the summit dome down to about 6500 ft, with moderate suncups below that and continuously skiable to 4600 ft at the saddle on Scott Paul Trail. The snow in the forest below that is discontinuous, covered in forest debris, and very rough -- not really worth skiing that when there is 6200 vert of good to great snow up above all the way to the summit. Smooth corn on the Roman Wall. Skiing past the crux crevasse near 8800 ft. 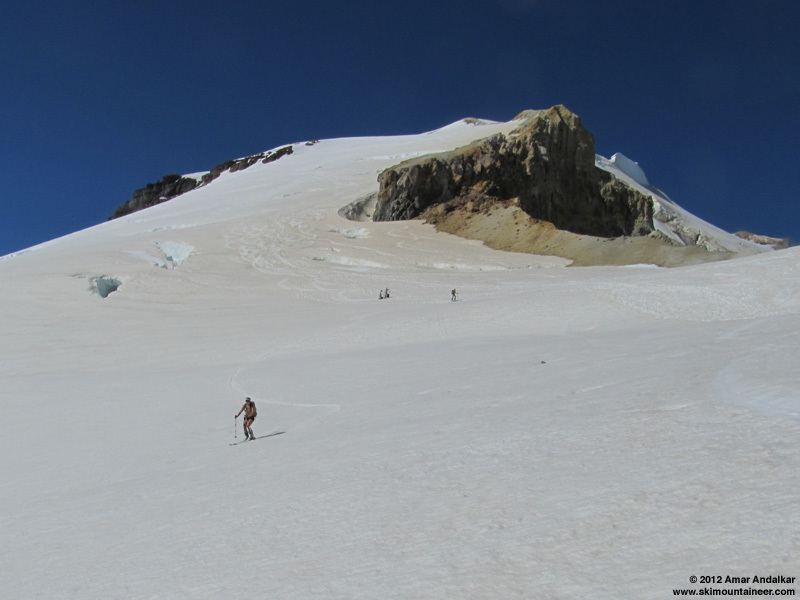 Details: I've been eager to ski the Squak Glacier for the past few weeks, especially as I hadn't skied Mount Baker since last October. But I felt reluctant about soloing it at this time given the potential crevasse hazards this year, even though I've solo skied the route several times in previous summers. 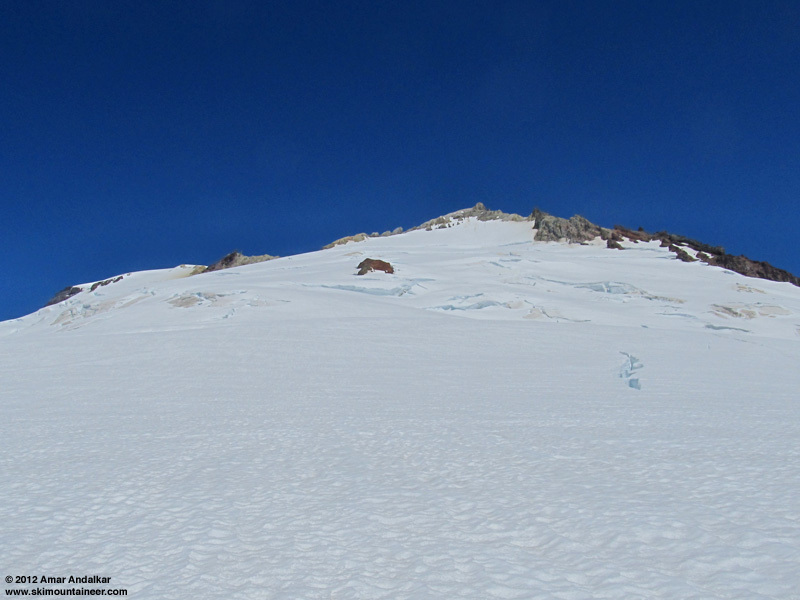 Many mid-elevation glaciers in the Cascades are looking much more broken up than normal right now, especially on Mount Rainier, and I wasn't sure if Baker would have similar problems. There's no point in soloing on hazardous terrain casually, unless you really have a strong desire to do so and feel comfortable doing it. 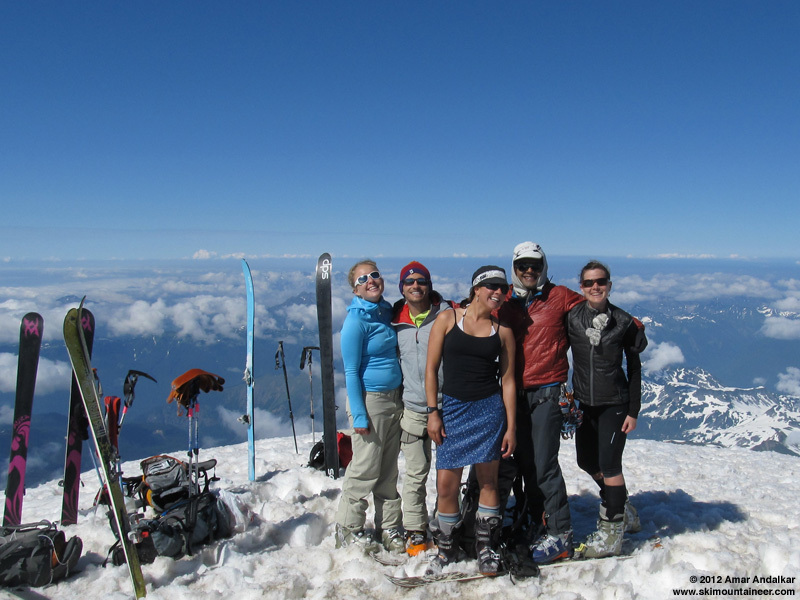 Thankfully on the last Saturday in July, several friends (Stephanie, Hannah, Jessie, Elliott) were eager to join me and give the route a shot. 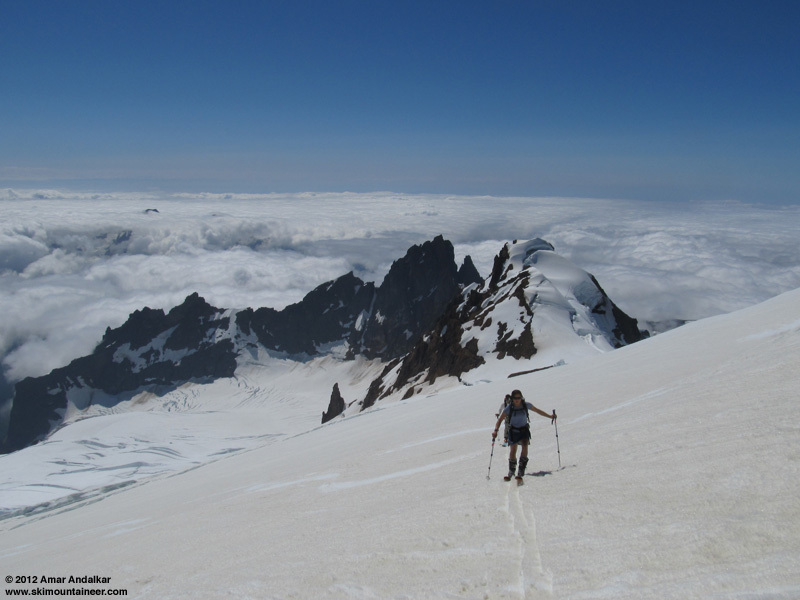 Given the lack of any recent trip reports from the Squak or neighboring Easton routes (other than a fairly negative report from two weeks earlier from a party that didn't go above 8800 ft), we did not know what to expect in terms of snow conditions or crevasse issues, and our expectations were low. They would be far exceeded this day. The forecast and UW model showed sunny skies above a marine cloud deck extending up to 6000 ft, a freezing level of 12000 ft and very light winds, with the weather expected to improve and clear out even at lower elevations by late afternoon. No reason to start needlessly early this day! We left Seattle after 5am, planning to start from the trailhead around 8am and summit by 4pm if crevasse conditions allowed, assuming a moderate pace. Unlike most one-day Baker summits which always seem to take much longer than expected, we would be pretty much on schedule this time. 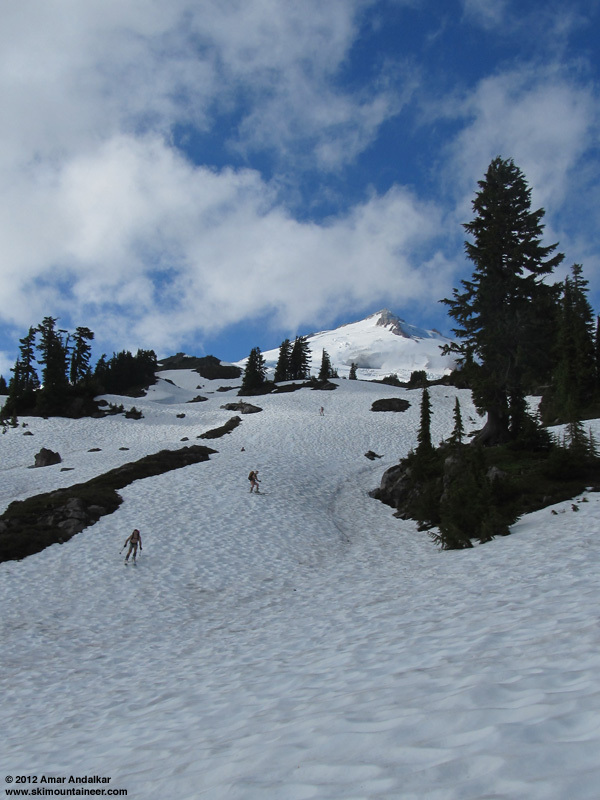 Although there are still a few large snow patches right at the 3360 ft trailhead (almost August! ), we knew the Scott Paul Trail would be mostly bare and so we hiked in shoes. It was mostly bare for the first mile and more, with a large 4-5 ft diameter fallen tree providing the main obstacle on the trail. No bugs in the morning though, so the hiking was pleasant if a bit sweaty under the humid cloud deck. Much more snow above 4000 ft, but not continuous or skinnable until the last few yards just below the 4600 ft saddle (2.3 miles). 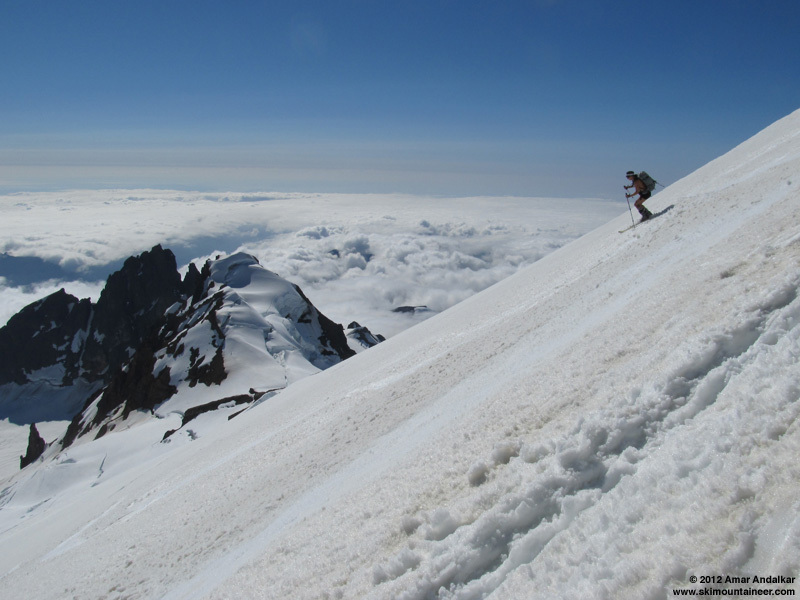 We skinned from the saddle, crossing a ski-length bare patch a few minutes later, but otherwise on continuous skinnable snow which extended all the way to within 1 vertical foot of the true summit. 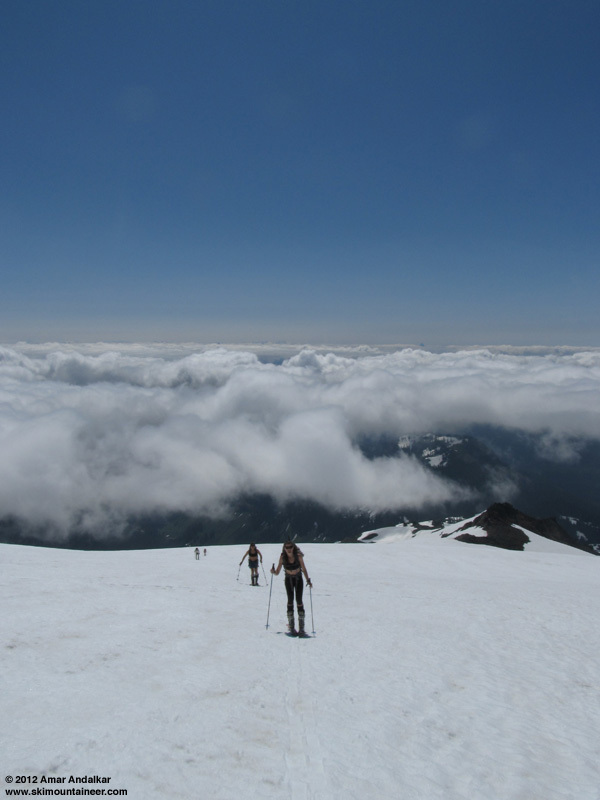 There were large sun breaks through the marine layer as we skinned up the ridge from the saddle, and we were mostly above the cloud deck by the time we crossed onto the Squak Glacier at the usual spot near 6000 ft. Smooth glacier with an occasional thin crack or sag to cross, until 8400 ft where the slope steepens and the route crosses dozens of obvious thin sags just below the usual large crux crevasse near 8800 ft. 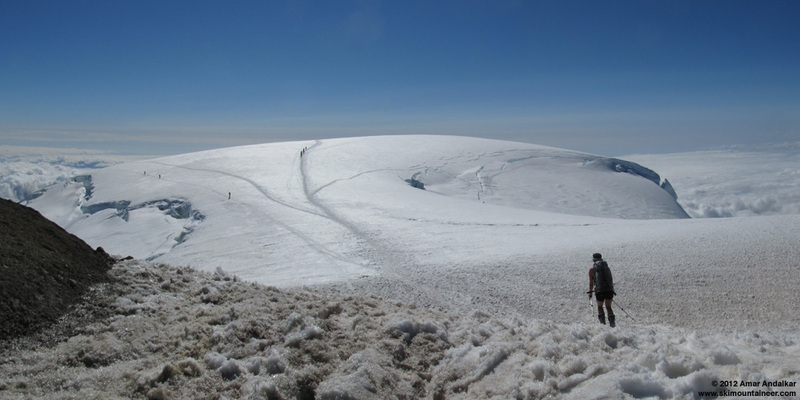 However, an end run around to the left bypassed this crevasse easily, on a gently sagging ramp which is many dozens of feet wide, far too large and solid to really be called a snow bridge yet. Many more small sags and cracks above this point up to the 9400 ft junction with the Easton route, but none were too worrisome. This area from 8400 to 9400 ft may become much more hazardous over the next few weeks as the cracks open and the bridges thin. 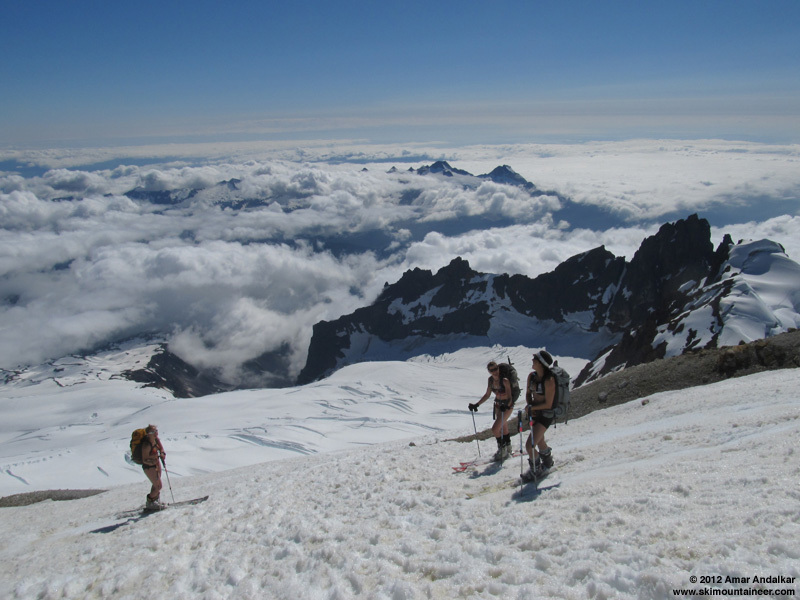 We had brought glacier gear just in case, but other than wearing the harnesses above 8400 ft, never felt the need to use the rope. Looking up from 8200 ft towards the crux crevasse area. 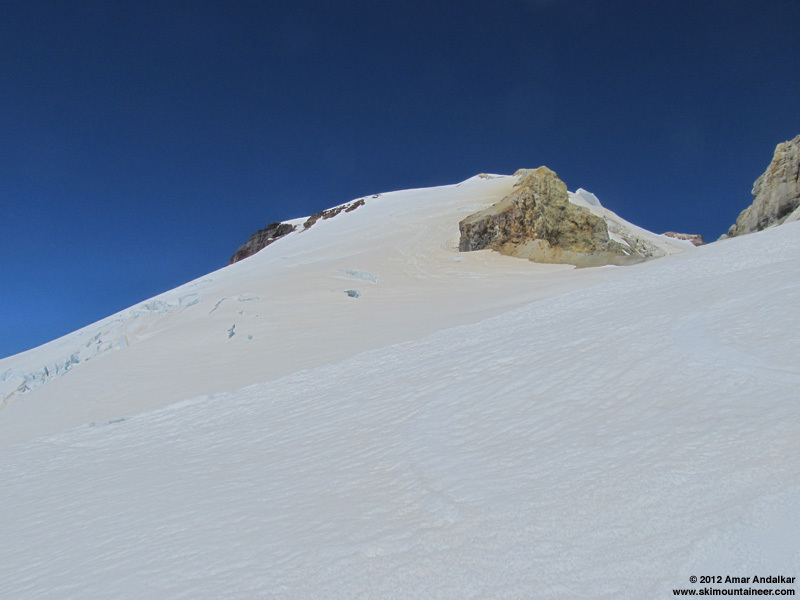 A faint bootpack and a pair of old faded ski tracks were visible above 8800 ft, but there were no other signs of previous parties and no one else at all on the entire Squak route from car to crater -- total solitude on a sunny Saturday. We did see a few descending climbing parties who had come via the Easton, and had a distant view of a pair of skiers descending the Easton route after 1:30pm (perhaps they'll post a TR, it would be interesting to compare conditions on the two routes which are entirely separate from the trailhead to 9400 ft). 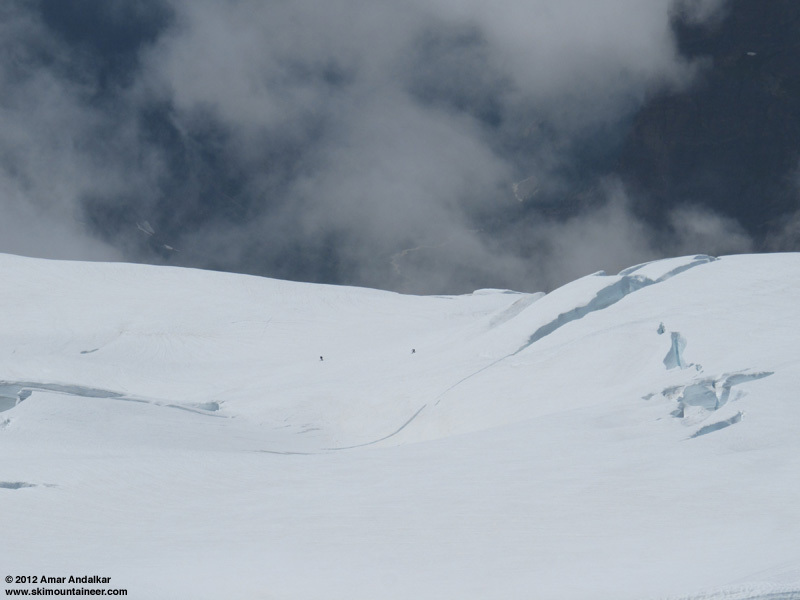 Zoomed view of skiers descending the Easton Glacier -- that crevasse the Easton route crosses is sketchier than anything on the Squak route this day. We took a break at the 9700 ft Sherman Crater saddle to melt a couple of liters of water on the Jetboil, thankful for a few small drifts of clean white recent snow several inches deep (not sure when that snow fell, but there was no other evidence of recent snowfall anywhere on the route). Above the saddle, the right side of the Roman Wall (or whatever it is properly called) is much more broken up than usual, with large crevasses all over the eastern part but the bootpack easily weaving through on solid footing. 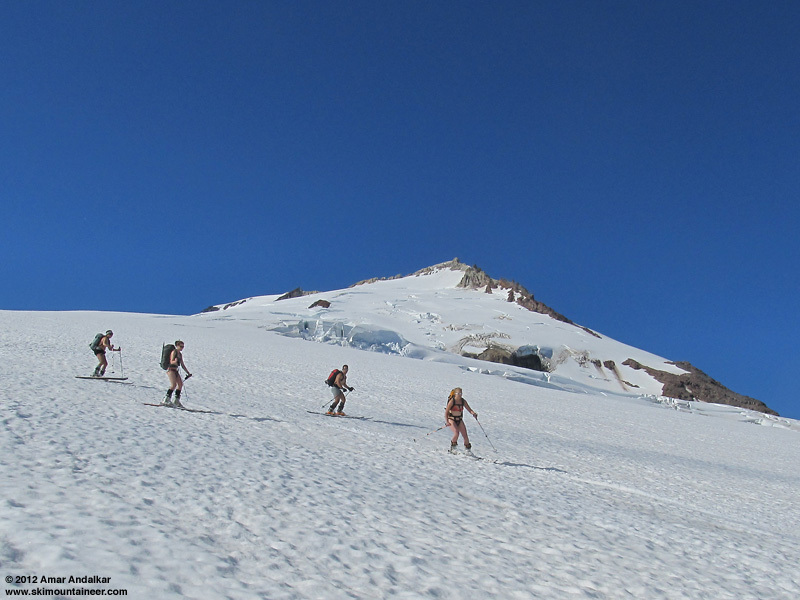 Three of us continued on skins, given the excellent skinning conditions on well-softened (but not slippery) corn, and completed a full ski ascent to the summit, putting in a few cautious switchbacks through the cracks near the existing bootpack around 10400 ft. 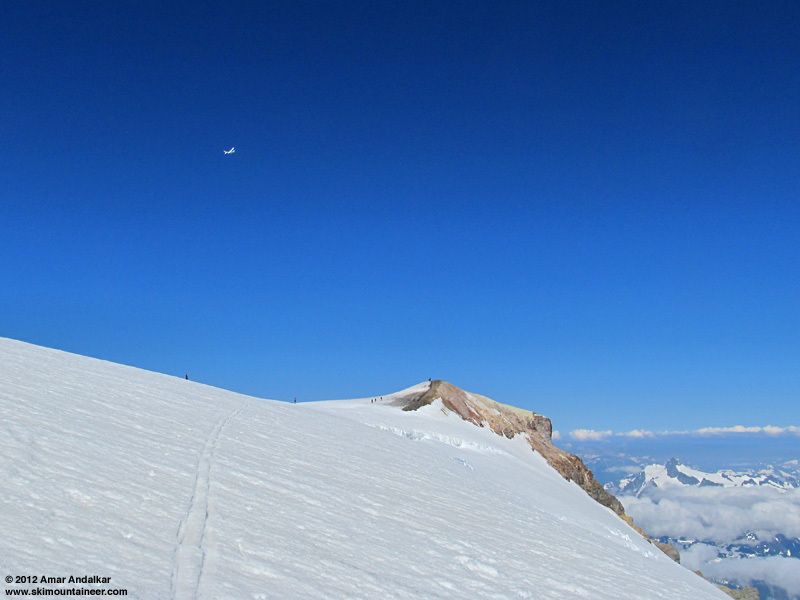 The true summit, Grant Peak, from the summit dome with Mount Shuksan at right and a small plane circling overhead. We topped out on schedule at 4pm, just after a guided party of 5 who had ascended the North Ridge. 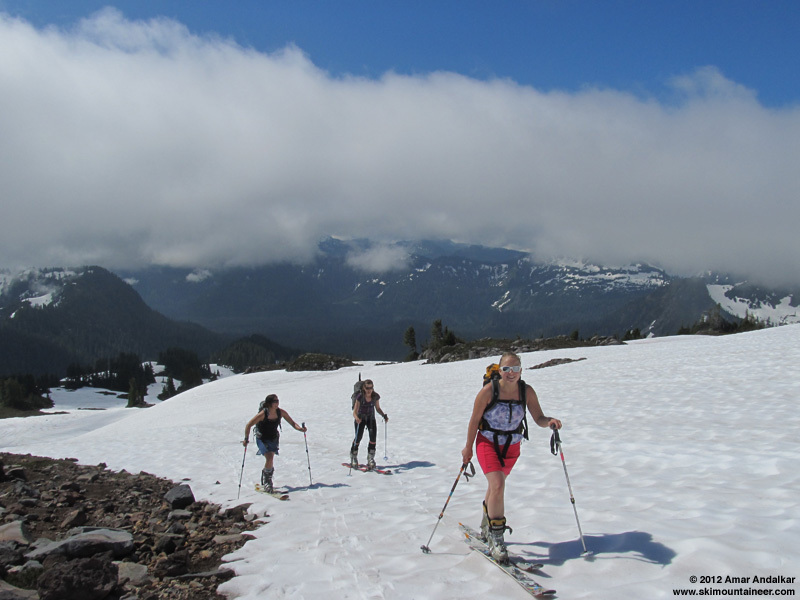 The women in our group had planned a bikini ski descent, and the weather was just nice enough to allow it, with bright sunshine, temps near 40 �F and a light breeze under 10 mph at the summit and basically calm below the summit dome. 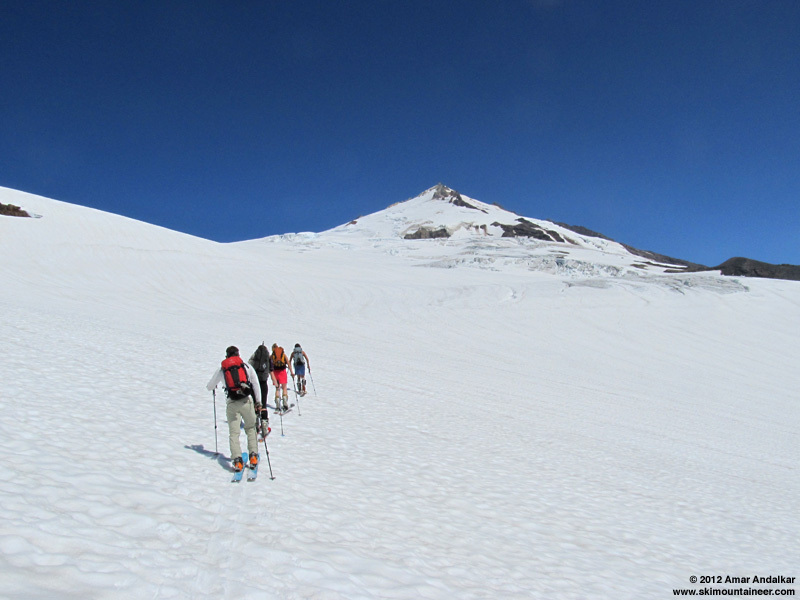 After a large number of celebratory summit photos, we skied down just after 4:30pm. Three-shot panorama (vertical camera) looking down the Park Headwall, Park Glacier, and Boulder-Park Cleaver from the summit. Other than the last 50 ft up Grant Peak which was very rough from foot traffic, the snow on the summit dome was mostly smooth corn. Two-shot panorama of the summit dome from Grant Peak. Dropping onto the Roman Wall found bumpy snow near the bootpack from old tracks, but sweet smooth corn just west of that. A lot of windblown dust and sulfur from the crater on the snow surface here, but it did not affect the excellent skiing. 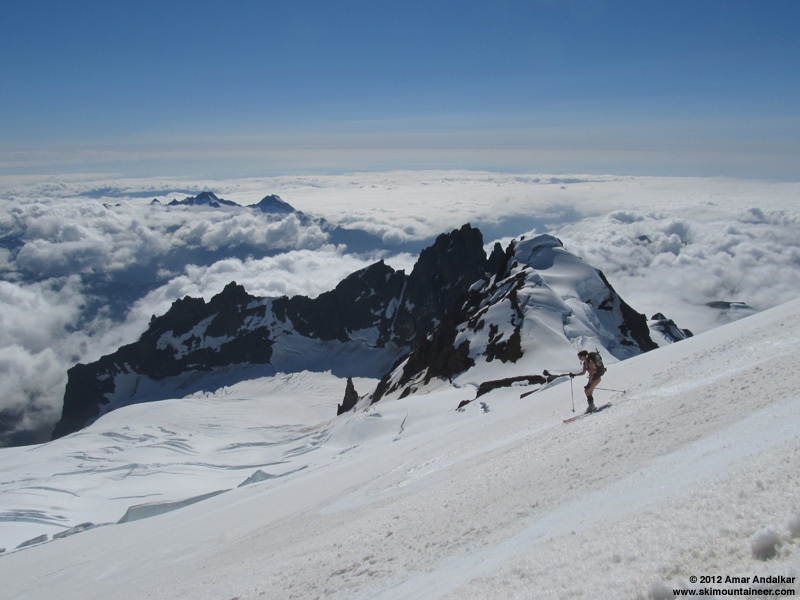 The fine ski conditions continued as we crossed back onto the Squak Glacier, smooth soft corn snow, now well-consolidated enough that it skied great at 5pm with no mushiness. As expected, the snow quality deteriorated as we skied farther down, with rougher snow and somewhat stickier for some of our skis. 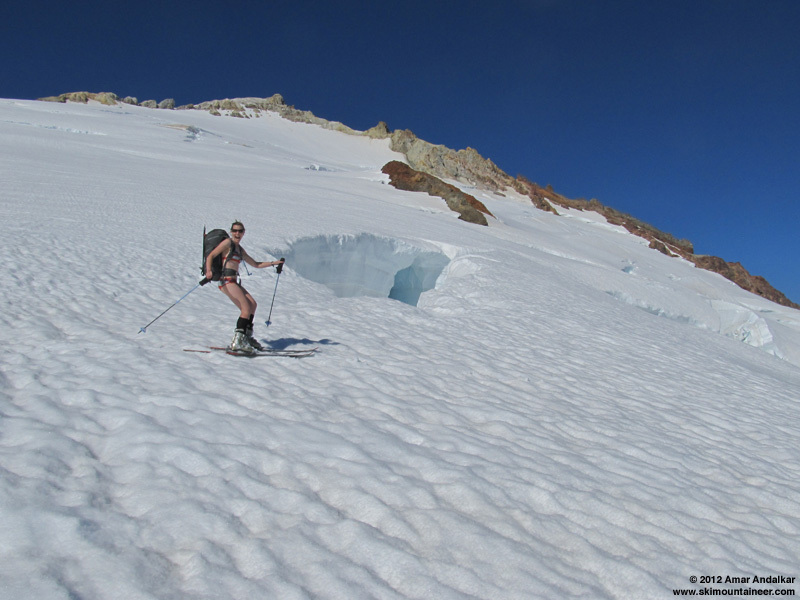 But it was still enjoyable and fun all the way down the glacier until back on the ridge below 6000 ft.
More suncupped and runneled along the ridge below Crag View, but not bad for late July and soft enough to ski OK. This area was below the cloud deck and so did not freeze overnight, but the snowpack here is now in a fully-consolidated midsummer state, so a proper freeze-thaw cycle is no longer necessary to avoid mushiness. Hucking off a wind lip. We ended our ski descent a few yards below the saddle where we intersected the trail at 4600 ft, as the snow in the forest was hard, still semi-frozen at 5:45pm, and very bumpy and dirty. It looked like it would be possible to ski down the gully from here for at least a few hundred more vertical feet, and later from the trail we could see solid continuous snow filling the valley below, so perhaps it may still be possible to ski down closer to 4000 ft, but the snow conditions did not appear to be pleasant or worthwhile. There were a few bugs and mosquitoes as we switched back to hiking mode below the saddle, but the hike out was fine, and bugs were not a problem at the trailhead either when we returned just after 7pm. 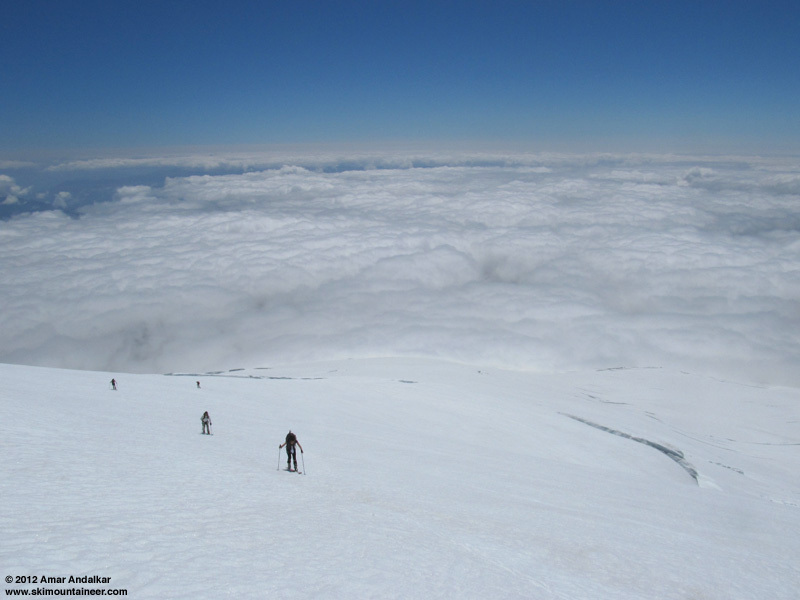 An awesome day of skiing in the sunshine above the sea of clouds on the Great White Watcher, about 7500 ft of ascent for 6200 vert of good to great summer skiing. 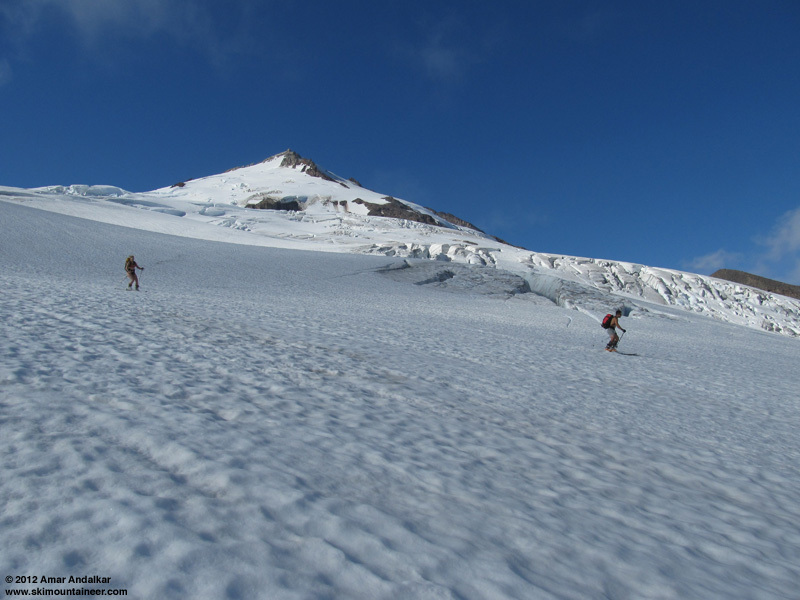 The Squak Glacier delivers as usual, continuing a string of three straight summers where it has maintained excellent ski and crevasse conditions throughout July and into August. 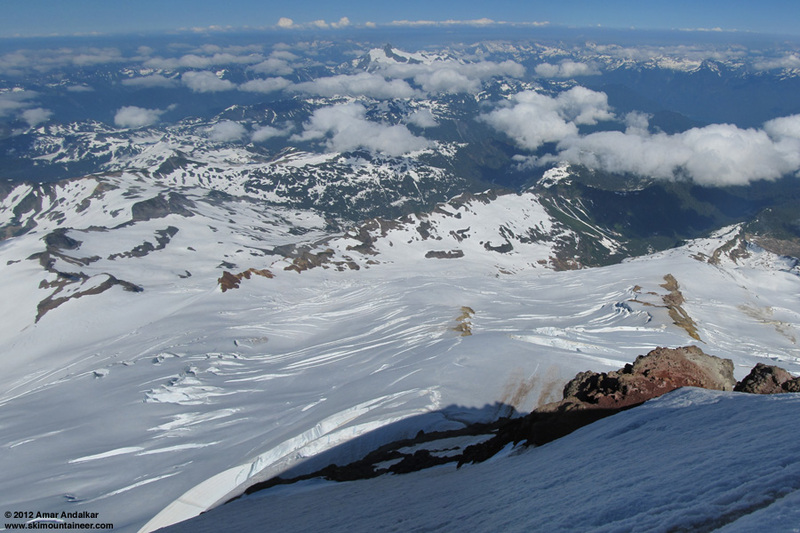 The 2010, 2011, and 2012 seasons have certainly been the best three-year period of summer skiing conditions in the Cascade Range since I started backcountry skiing in 1996, and probably since at least the early 1970s. 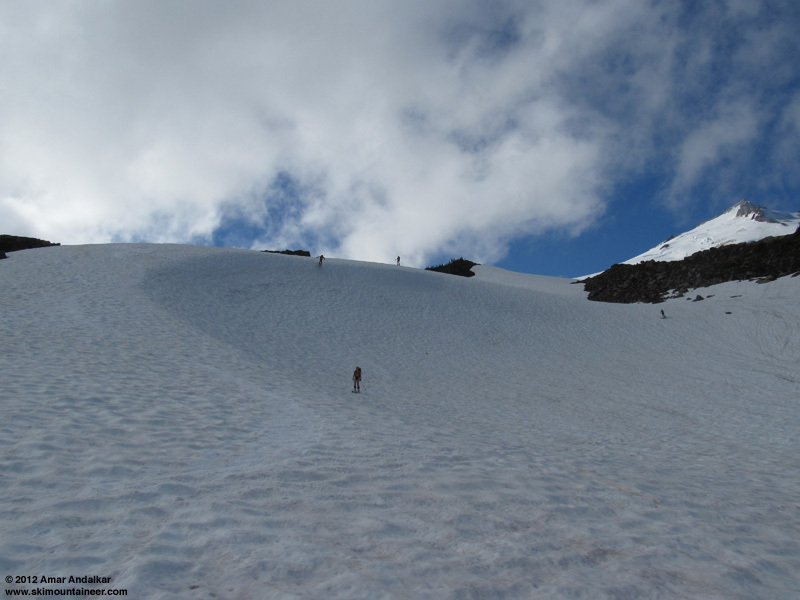 Each of these summers has had an exceptionally deep snowpack throughout July and into August, far-above normal in 2010 and 2012, and with near-record depths in 2011. 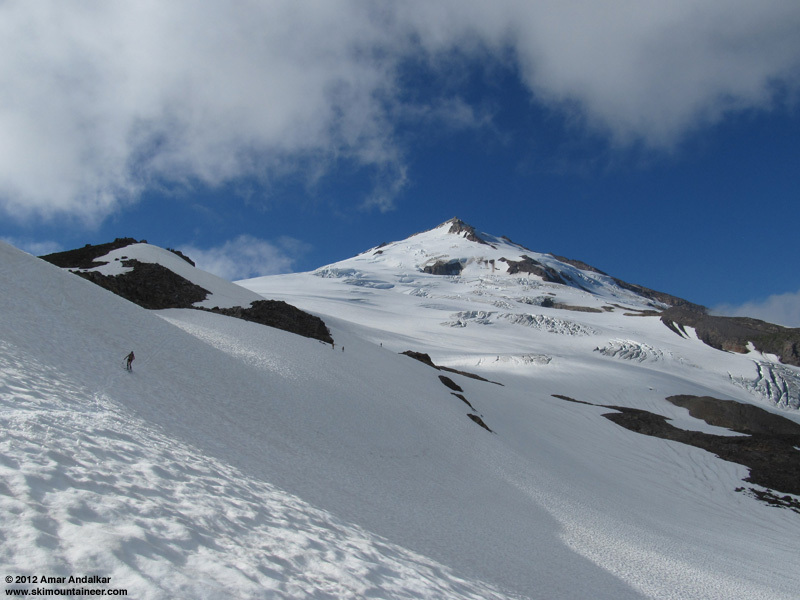 These three unusually great-for-snow summers have spoiled us -- it's hard to remember that the skiing is rarely this good or this extensive during most summers! 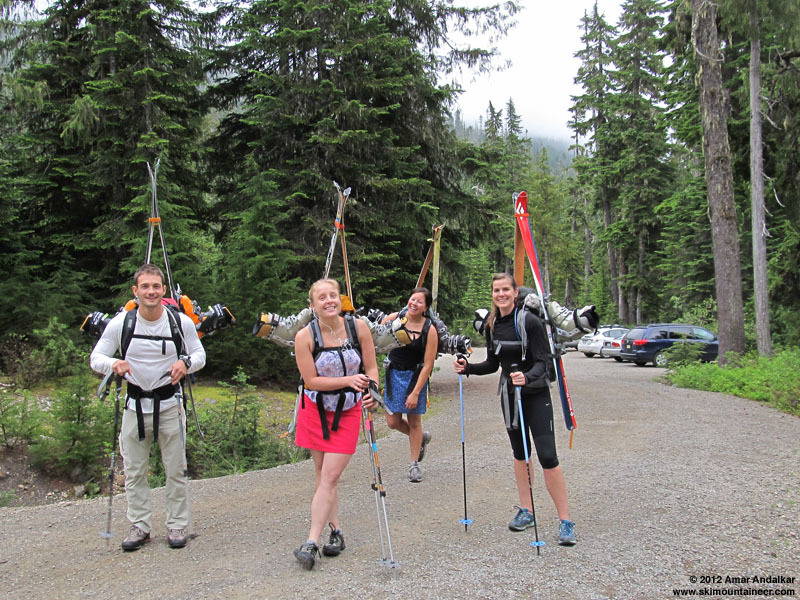 We are so fortunate to have been here and been skiing these years, a period that those of us who kept skiing through these three summers are likely to remember for decades to come, as a golden age of Northwest summer skiing. Nice! I'm hoping Adams is simalarly still in shape this wk-end. Anyone interested in two or three nights on Adams Aug. 4-7? I am so sad to have missed out! But I love seeing all the pics with tennis skirts and bikinis! You girls rock! We should do this on every trip!! I am so sad to have missed out! But I love seeing all the pics with tennis skirts and bikinis!� You girls rock! We should do this on every trip!! I couldn't agree with you more Khanh, especially during the winter. 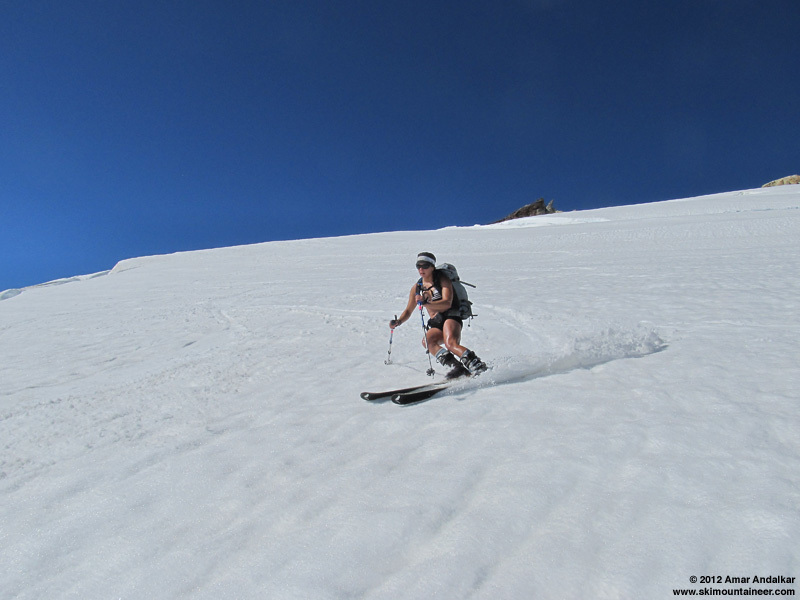 Astute choice of skiing partners, Amar - a few miles further south we were treated to this wild Spandex sighting . . .
Y'all are hot. But I don't see any skin shots of you Amar. Pourquoi? Will freezing levels ever be high enough to tempt Amar to shed some layers? That remains to be seen. Stellar report & pics. Thanks for the 10 minute vicarious escape from the slow cubicle death. Love the summit shot of you all! Sounds like it was a great trip. Love the bikini ski too. The only one in his bikini was Silas on our trip last month. I wore my sports bra but was not about to ski in my undies. Amar must have at least been in shorts...no? Great to see you up here visiting Steph! Would have loved to see Lander galloping behind you in a photo. I gather he was relegated to stay home with Dave.